Not everyone has the same needs when it comes to freezer cooking. Our members are stay at home moms of many and expectant parents; college and graduate students; 20-something careers and entrepreneurs; traditional cooks and those cooking for special allergies; couples with no children and retirees; cross fitters and even dads! We create a number of different menus to meet the biggest needs, but nothing beats a custom freezer meal plan. Our membership allows you to choose from over 6,000 recipes to create your perfect menu, but how does it all work? 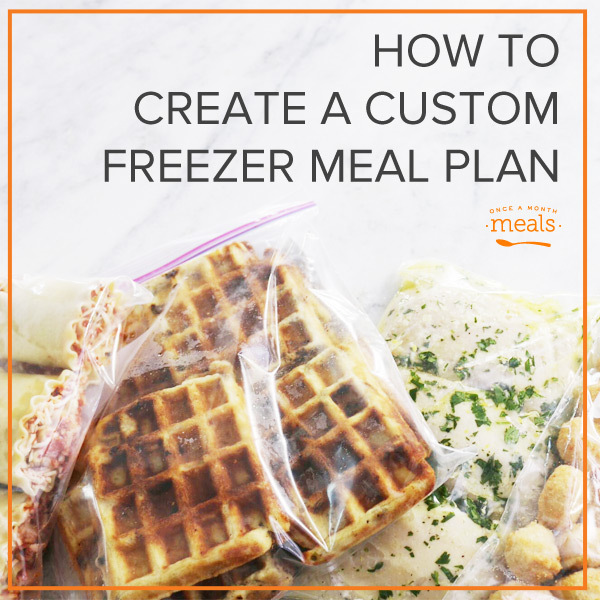 Learn how to create custom freezer meal plans with your Once a Month Meals Membership! We get lots of questions about exactly how to create custom menus, so today we will walk you through the process step by step! Make a menu by editing and customizing an already curated menu. Click here for more detailed descriptions of our menus. 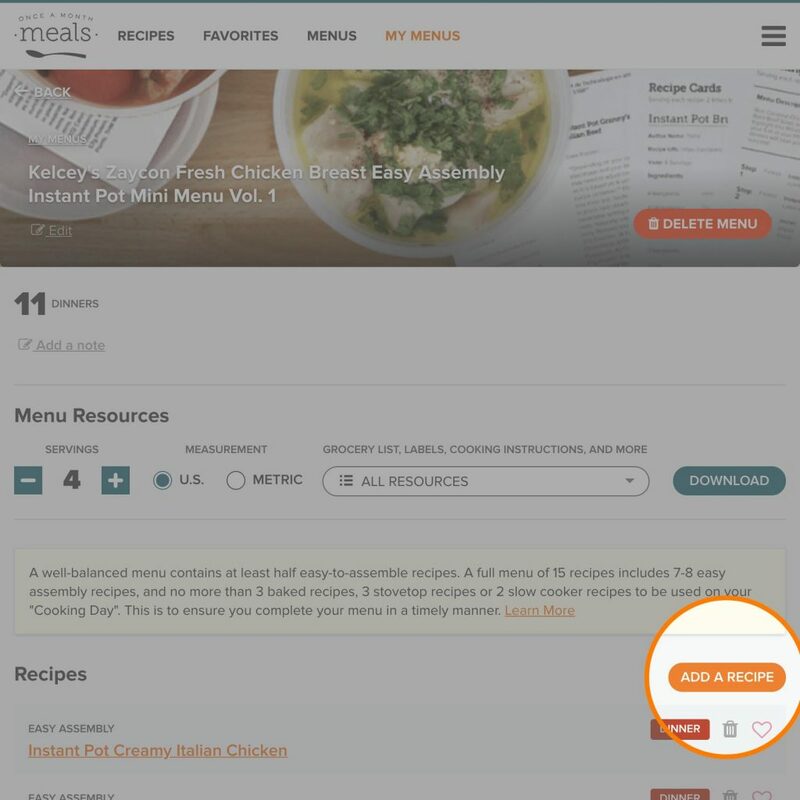 Make a menu by finding a recipe you like and building a menu based on that single recipe. 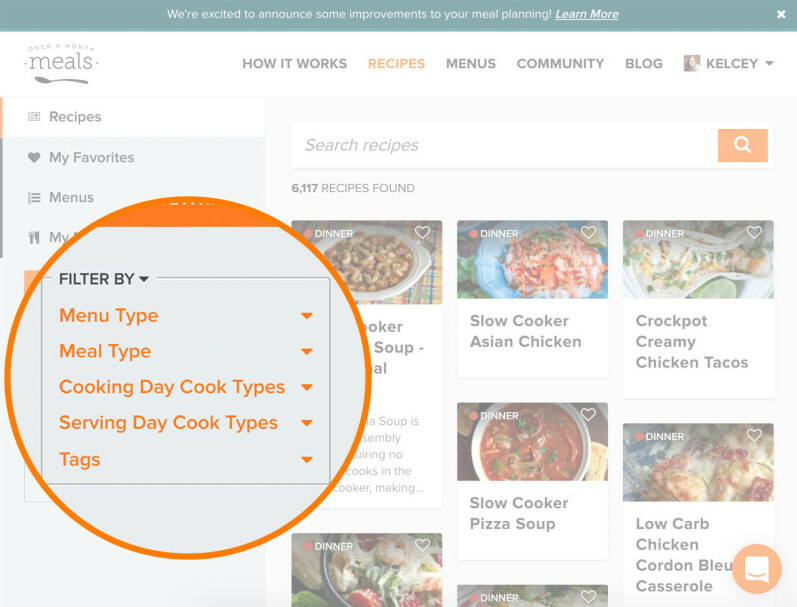 Make a menu based on your favorite recipes using your “My Favorites” list. If you are completely new to freezer cooking, you should start small by cooking one of our Mini Menus. Mini menus (5-6 recipes doubled to 10-12 meals) are shortened versions of our full menus (15 recipes doubled to 30 meals). They also tend to be designed for specific seasons or occasions, such as an all breakfasts or side dishes, holiday themed, or using seasonal produce. Now you are ready to start mixing and matching to your heart’s content. BUT we have A LOT of recipes! This is good for you, but it can also be a little overwhelming if you just start browsing over 6,000 recipes at random. So let’s break it down into a few steps so that you can find what you really want. We provide 11 different menu types so that you can choose the best one for your dietary needs and budget! Depending on your personality and stage of life, breakfasts and lunches may be your focus (think breakfast on the way to the gym or packing lunch boxes). Then again, maybe you like our regular system of having a variety of meal types to pull from the freezer. So first, decide how many of each meal type you would like to include on your menu, and then narrow your search using the drop-down menus in our MenuBuilder Search. Cooking Day Cook Type: The method of cooking or preparing your meal BEFORE freezing it. Serving Day Cook Type: The method of cooking or reheating your meal AFTER freezing it — to serve and then eat. How long do I want to spend in the kitchen on my freezer cooking day? Choose dump and go (i.e. throw and go in the bag) recipes or simple stovetop recipes under “Cook Day Types” to save time. Baked recipes will eat up a lot of time. How long do I want to spend prepping my meal on serving day? Choose ready to eat (for serving day this usually means reheating) or simple stovetop and grill recipes under “Serving Day Types” for meals that go from freezer to table very quickly or with little hands-on time. Do I want dinner hot and ready when I get home? Do you want to be able to cook meals from frozen? Need a super quick, hands-free cooking method? There are lots of options, so choose based on your time constraints. 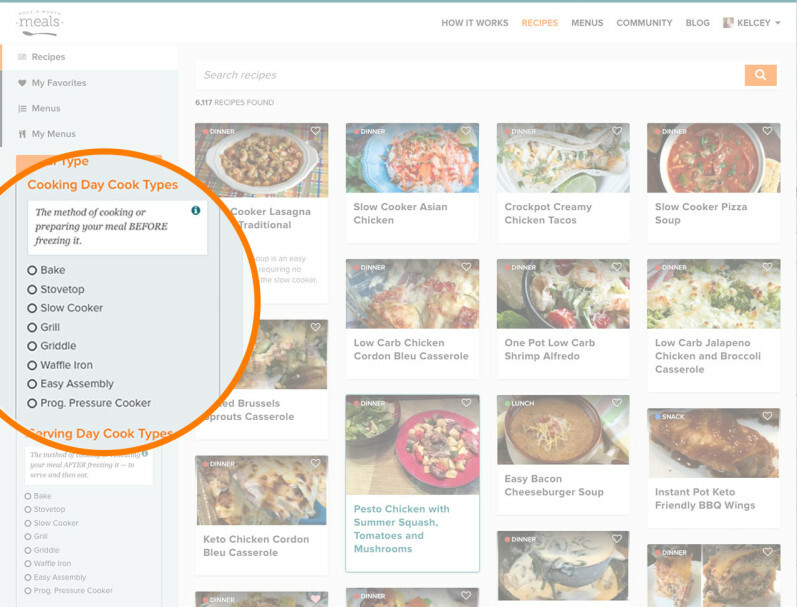 After you choose meal types, there are a plethora of tags we have assigned to recipes as well as a keyword search bar to help you narrow down your desired recipes. First, think back to that original menu type that you started with (Traditional, Paleo, Diet, Allergen, etc.) You will find tags for each of these menu types, but they will also include recipes not found on that menu. 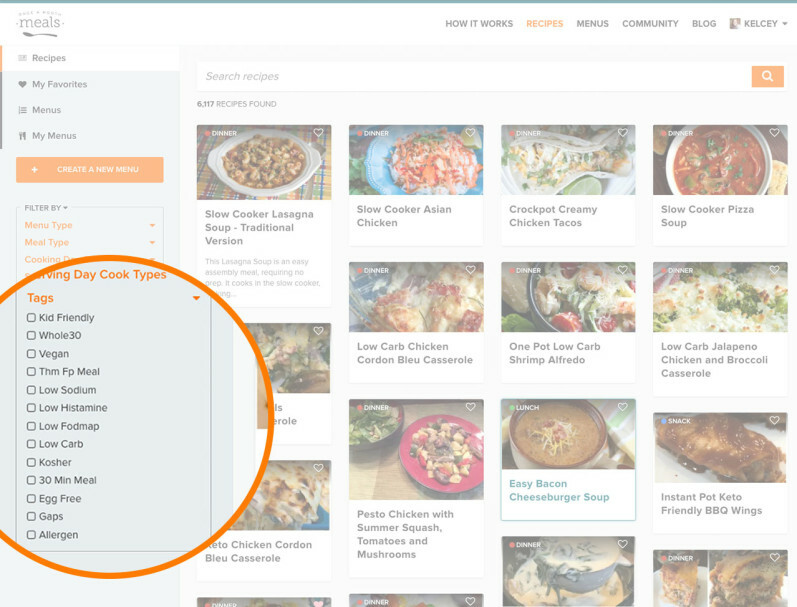 Sometimes a recipe can fit more than one descriptor (for example Real Food and Paleo, or Diet and Gluten Free), so when you click on the tag, you will find all of the recipes that fit that description no matter where they originated. But our tags go further than that. Our Allergen Menu rotates through different specialty diets, so there are tags for each of those. We have tags for different diet systems such as Trim Healthy Mama, Whole30, and Weight Watchers. You can even search recipes by season. 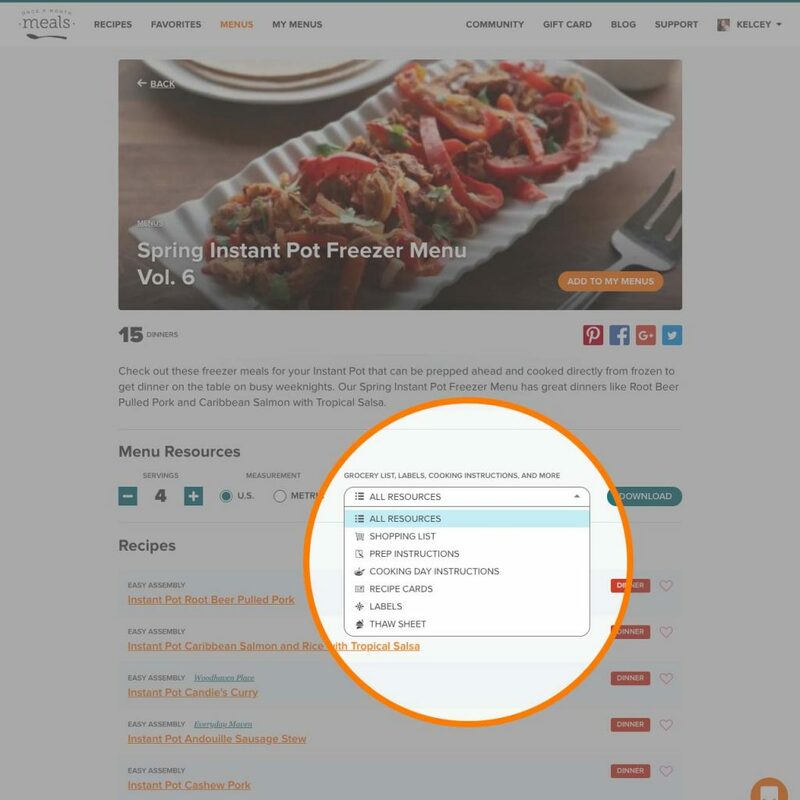 Narrow down recipes by using the keyword search bar. 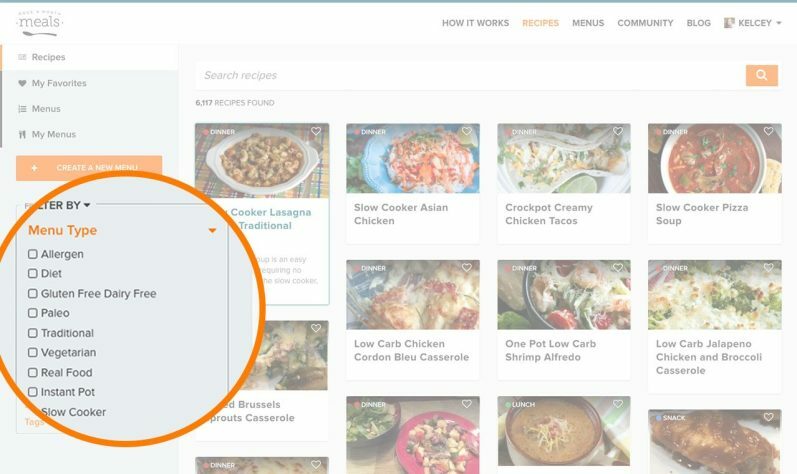 Find Recipes and Menus Even Faster using our Search! 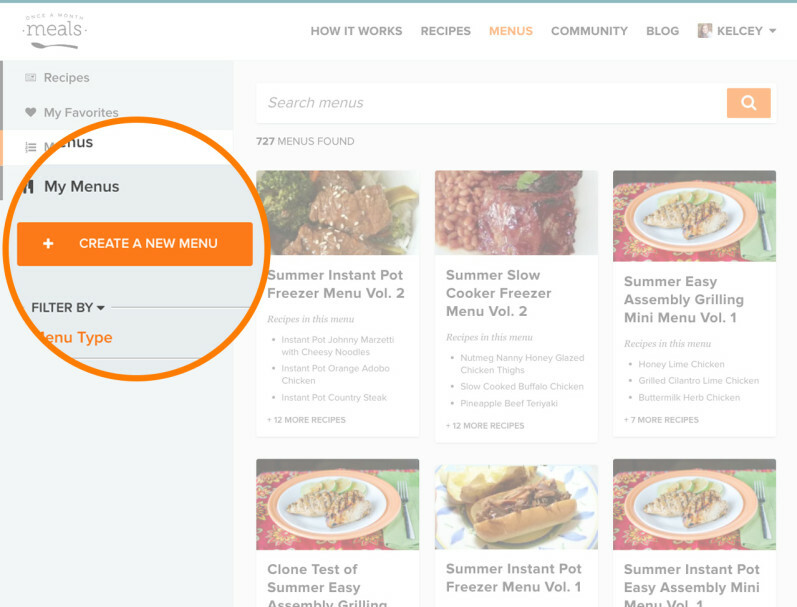 There is now an updated search experience as you look for new freezable menus and recipes! 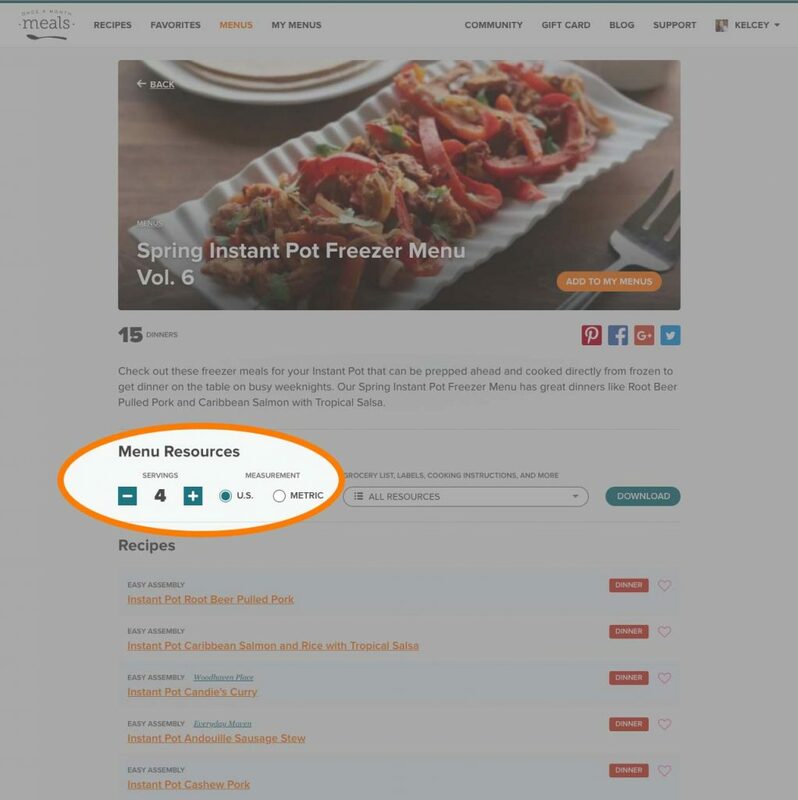 With that, you also have more detailed filters and tagging options in the new left-hand sidebar that makes finding recipes and building freezable menus even easier! Keywords, Ex: Taco, Southwest, etc. Ingredients, Ex: chicken, sweet potato, etc. Name & Title, The title of the recipe or menu if you know it. The keyword search bar is helpful if you know the title of a recipe. 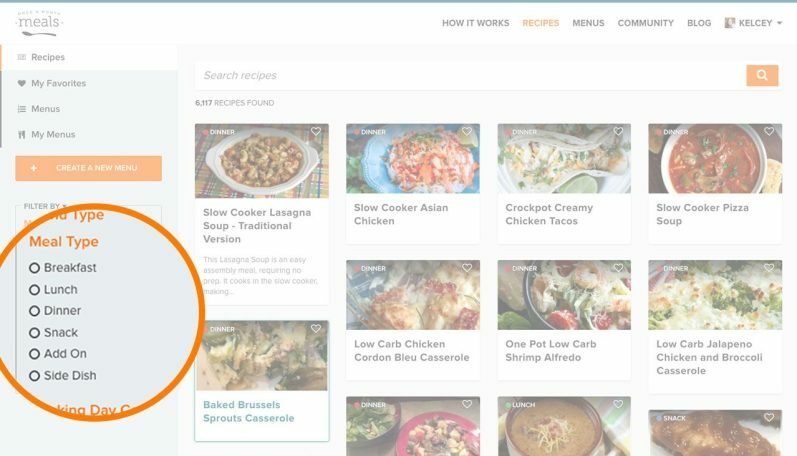 You can also use the keyword search to look for recipes with specific ingredients. If you got a killer deal on ground beef or chicken and want to use that as the basis of your menu, you can search “beef” or “chicken.” Or make use of seasonal produce items while they are at peak freshness. This can also help if you already know you have three chicken recipes on your menu and you don’t want any more! Narrow the search to other types of meat. Remember how we talked about starting with a full menu back in the first step? Well, now it is time to whittle down your list. I know from experience that one can get carried away and start thinking thoughts like, “Shoot, why are there only 15 slots? I could totally cook 25 recipes in one day.” — Trust me. You can’t! Be realistic about the number of recipes you will be able to complete in one cooking session, what your shopping budget is, how long you want the meals to last, etc. Remind yourself that each of these tasty recipes will be doubled and you will get to eat each of them twice regardless. In our experience, 15 recipes is the upper limit of what one cook can accomplish in the kitchen in one freezer cooking session. If you are superhuman and you blaze through and are ready for more, then you can make a new custom menu! We recommend that those new to freezer cooking start with a mini menu containing 5 to 6 recipes (again each of these will be doubled, so you will have 10-12 meals). Mini menus also work well if you are short on time or you have a smaller budget for batch cooking. Maybe you just don’t need a meal for every night of the week. When you have decided how many recipes you are going to cook, go ahead and delete the recipes you don’t need from your list by hovering over the recipe you wish to delete. 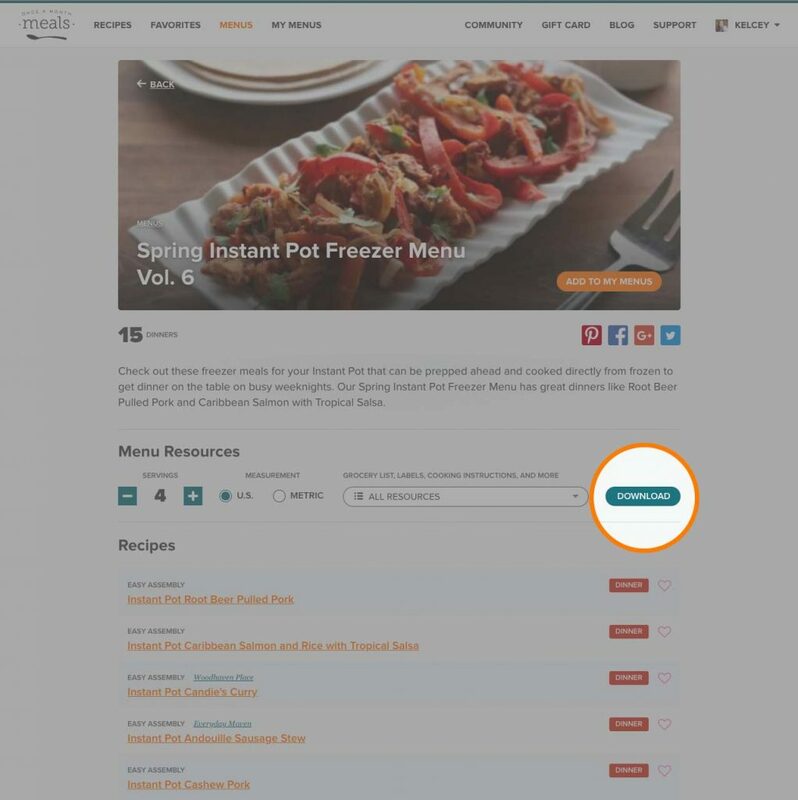 When you hover, a red “Delete” button will appear on the right-hand side of the recipe. Simply click to delete. Almost done! Your last step in customizing is to choose the number of servings you would like of each meal. We feel that it is the most efficient use of your time to double each recipe so that you can eat it twice throughout the month, and so our system will automatically double each recipe for you. Therefore, if you enter “4” for your number of servings, you will actually end up with 8 servings, and you will split the meal into two containers for easy portioning (you will see specific directions on your recipe cards). Once you have entered your number of servings, print your custom documents listed below, and you are all ready to fill your freezer with your own custom freezer menu plan! If you are new to Once a Month Meals, please check out our How It Works page for more details on what your cooking day will look like. 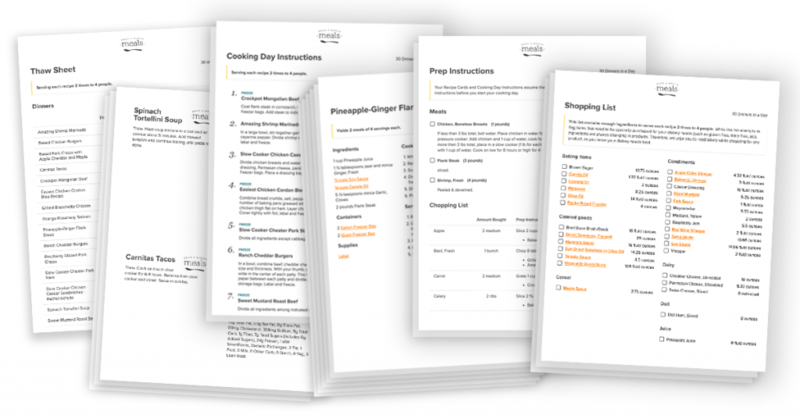 If you love the idea of custom freezer menu plans, then sign up as a Member today! Why does OAMM always double the servings? Why not just put the total servings for that menu and be clear about it? Hi Michelle – For the sake of efficiency, our system will automatically double the recipes for you (when they are added to a menu), creating two meals for each recipe for the desired number of servings. So, for example, if you select a serving size of 4 – you will end up with a total of 8, which will serve 4 people, two times. On the recipe cards Michelle, it should say … if you select 4 servings … this meal makes 2 meals, 4 servings each. Would you like to see 8 servings total on the resources?